Bring along the whole family for a fun camping trip in this travel trailer that can sleep ten people each night. The bunkhouse includes four bunks and a wardrobe with a countertop for the kids' books and toys. 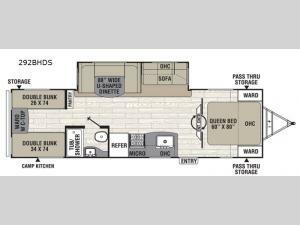 You'll appreciate the 88" wide u-shaped dinette and sofa for extra seating and sleeping space. There is a queen bed in the front private bedroom and wardrobes for your clothes. After a day at the lake, clean up in the full bath, then whip up some dinner on the three burner range. Come check out this travel trailer today!